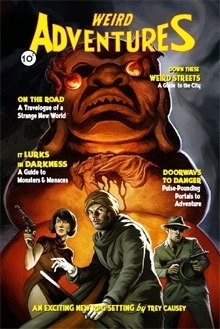 Just got Issue #7 of Loviatar in the mail. Another great issue from Christian. I really feel like Christian is hitting his stride with this series. 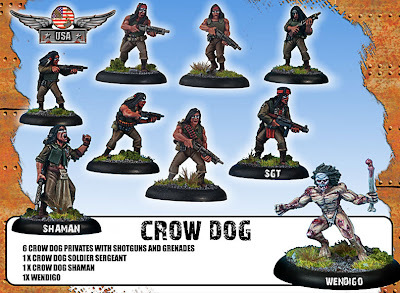 They have all been great, but his run on the Hexcrawl/Sandbox series is spot on! Anyways if you haven't checked this out yet I encourage you to do so. Good Stuff! Off to play Castles & Crusades in a bit! This will be our third session. The players have done very well so far. Although Thunk Thunk the Half-Orc Barbarian came very close to death last time, only the timely use of a healing potion kept him from dying. Actually I believe he came close to death twice. heh heh heh. 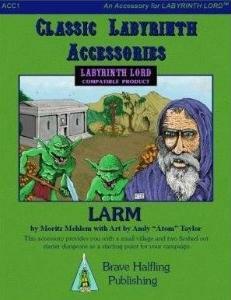 I'm using the Labyrinth Lord Module: Larm with some of my own twists and turns thrown in.. 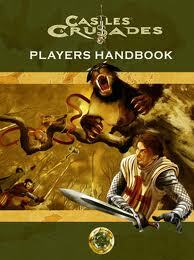 Simian Saturday : If I could play Labyrinth Critical! oh wait I can!!! Thought the above picture (70's era Cher with Planetary Apes!!) was quite appropriate for this Simian Saturday post. Arcadian over at the No Signal blog has been working on some Labyrinth Lord write ups for Encounter Critical! He is calling it Labyrinth Critical! Now why didn't I think of that?! I can't wait to play a Planetary Ape! Love that classic Kirby Style! 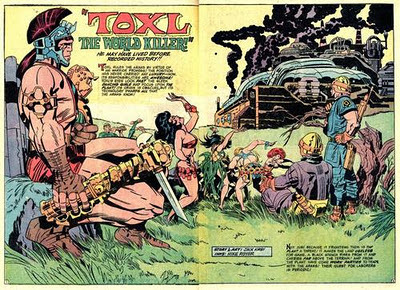 Think I may work up Toxl; The World Killer as a diety in my next campaign! HELLCOW! 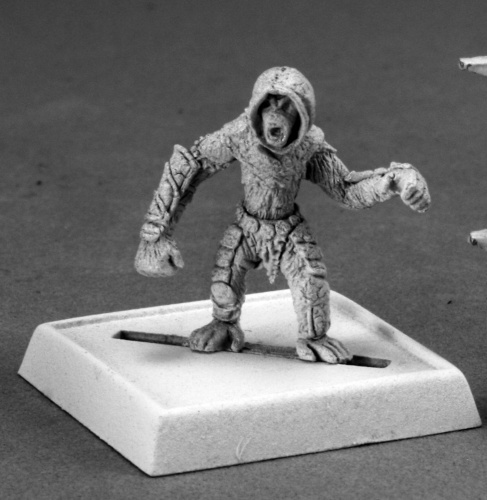 ; an undead beastie for your OSR Games! The wife and I went to see Underworld today, which got me thinking about vampires in games which gave me a crazy idea!!! 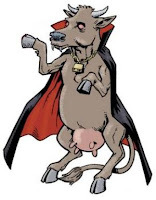 Whispered legends tell of a dark night when the Lord of Vampires was unable to find a human victim to feed upon, one farmer had failed to lock up his favorite cow; Bessie, the Lord of Vampires took his fill from the poor beast, and it wasn't milk he was after! The farmer finding his beloved cow dead the next day couldn't bear to eat her so he buried her. Three nights later, Bessie Returned!! Hellcow is immune to charm, hold and sleep spells. Electricity and cold does only half damage, she is unaffected by normal weapons, and regenerates 2 hit points per round. Like regular vampires she must take refuge from the sun during daylight hours and once in awhile she must sleep in an old barn to maintain her powers' vitality. Like other vampires she can assume gaseous form at will and can grow large bat-like wings enabling her to fly. Bessie can feed upon humans and cattle, but prefers to feed upon farmers, possibly due to some resentment towards her former owner who left her out that cold night so long ago. It is believed that Bessie cannot create more of her own kind. Bessie can summon 1d10x10 bats when underground, although she seldom goes underground. If she can summon wolves, she has never done so; perhaps being a cow in her previous life makes her uncomfortable around them. Bessie has on rare occasions exhibited the Charming Gaze of a vampire but those attempting to resist it get a +2 bonus to their roll, because..well she's a cow! Bessie has the other abilities and weaknesses of vampires with the addition that a weapon forged from a milk pail will strike her as though it were a magic weapon! Legend has it that Bessie's vampiric blood-infused milk has various restorative properties to those who drink it. It can purportedly Cure Diseases and even Restore energy levels lost from the attacks of other undead creatures (possibly even Bessie's own attacks) although its full effects are unknown. Bessie has a distinctive laugh,"hahahamoooo!" 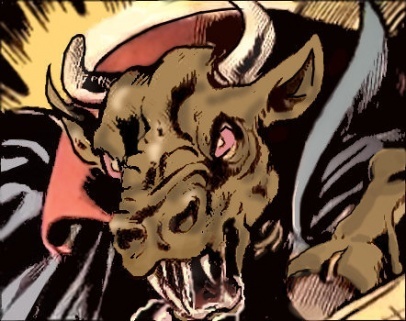 Based on the Hellcow character from Marvel Comics, no copyright infringement is intended! Got My DCC Poster! DIG IT! For a limited time you can get the DCC RPG Poster (Dungeon Crawl Classics) sent to you for FREE! 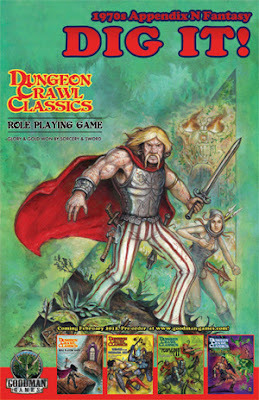 I haven't played the Beta of the DCC rules yet ( I think the game has been pushed back to April), but I think I'm going to try out the Critical & Fumble tables from the Beta version in our next C&C game. Special Thanks to Trey for bringing this cool picture to my attention! "She who must be Obeyed!" and I are going shopping today. Maybe I can work up a concept behind these guys while I'm out and about. 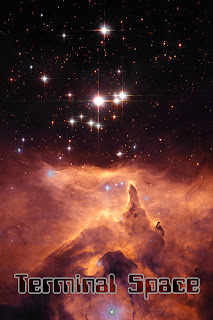 Their canes and coats give them an air of importance or self-importance... 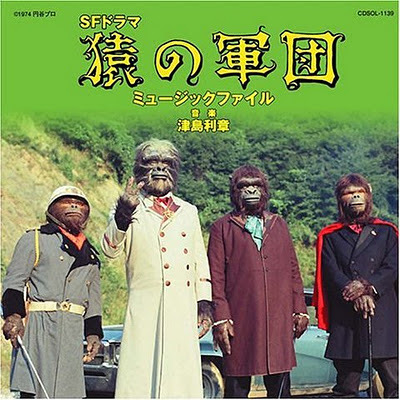 The Lords of Simian City or some such? Hmmmm... something to ponder! I hope everyone has a Great Simian Saturday! Finally got to get some gaming in after an unscheduled break. We played Session 2 of our Castles & Crusades game today. 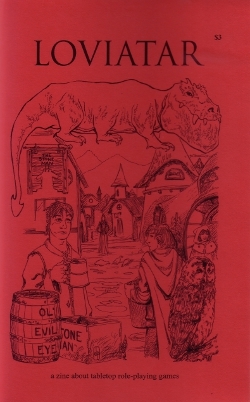 I've adapted the great Labyrinth Lord Module; The Village of Larm for my C&C game. Really not much adapting needed. C&C is great for me, because everything in my gaming Library will work with it fairly easily, well 4E takes a bit more work....oh wait, I don't have ANY 4E products in my Gaming Library..that's right. heh heh heh. Anyways, Larm is alot of fun, I encourage anyone looking for a basic but fun starting point for first level characters to check it out. 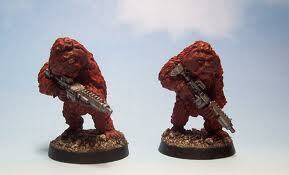 Course now my folk's characters have made mortal Enemies out of the Guido Brothers! Never a good thing! Hope everyone had a great weekend and hopefully you got to get some gaming in! Simian Saturday : The Hadozee! For me, one of the many cool things about Star Frontiers was the Yazirians. 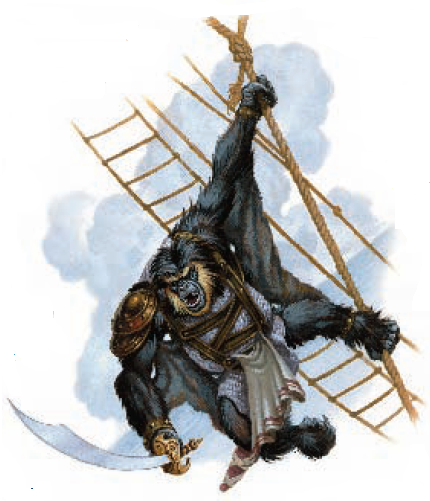 TSR brought them back as the Hadozee for SpellJammer and WotC brought them back yet again in the 3.5 book Stormwrack book as sailors on the high seas!! • +2 Dexterity, –2 Charisma. • Hadozee base land speed is 30 feet. • +4 racial bonus on Balance and Climb checks: Hadozee are natural climbers and have no fear of narrow pathways. holding something in one hand. • Automatic Languages: Common, Hadozee. 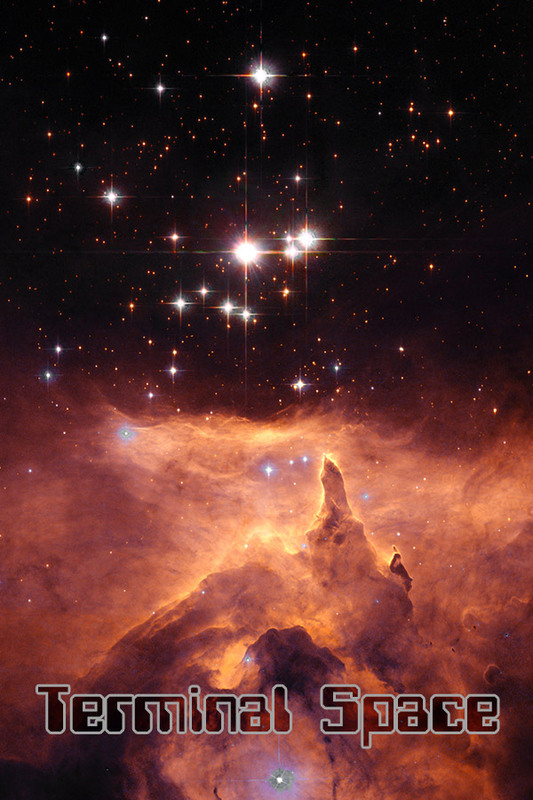 Bonus Languages: Aquan, Elven, Halfling. Lot's of cool stuff has recently been made available via Lulu! Sorcery & Super Science has released a plethora of their Advanced Adventures line via Lulu! This is great news for folks like me that prefer book in hand as to PDF. And don't forget about the other great products that continue to be released! Too many to list here, which is awesome for an OSR guy like me! Woo Hoo! And no I'm not here to talk about 5E. *Edit* Can't believe I forgot to mention Trey's Uber Cool! 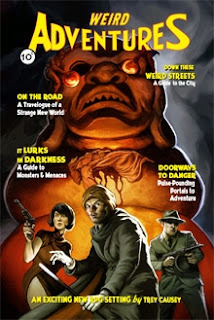 Weird Adventures now available in Hardback or Softcover!! (I know its on RPGNow and not Lulu). A while back I posted about the Scout comic series. Well West Wind has come out with some awesome native americans with machine guns and flak jackets in 28mm check them out! Perfect for use as Scout or other Post Apocalyptic coolness! 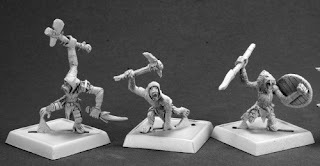 Simian Saturday: Monkey Miniature Roundup! Up first some new offerings from Reaper, specifically for the Pathfinder RPG, but can be used for whatever fantasy monkey mayhem you desire! 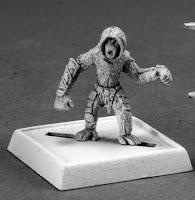 If your wanting something a little more sci fi, a la Mutant Future or somesuch check out these from Sgt. Major Miniatures Get Some! line.